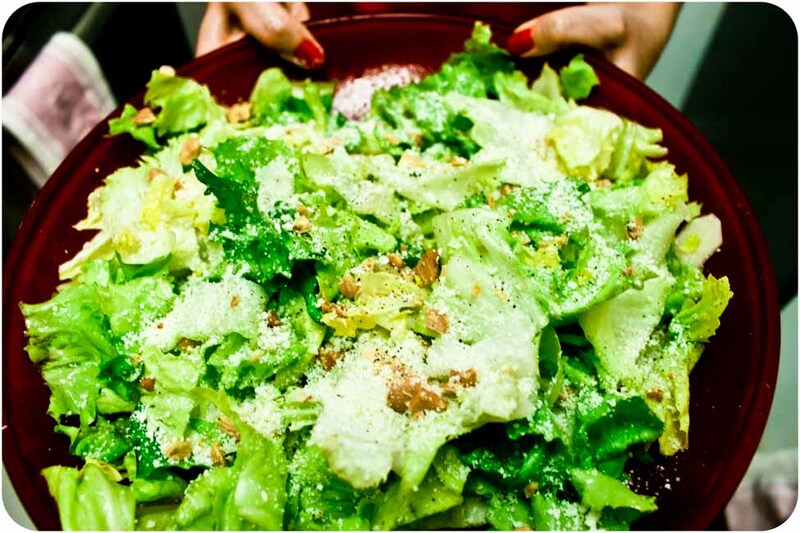 One of my favorite Fall salads is the Escarole Salad served at Otto in New York City. I used to live walking distance from Otto, which meant lots of delivery. 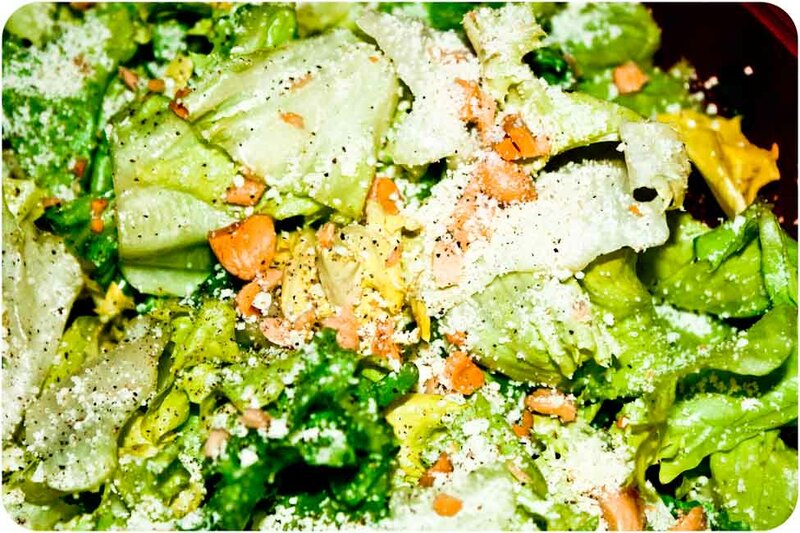 But now that I live farther away–and out of their delivery range–I decided to try to recreate this salad. Almost all of the ingredients were obvious: escarole, marcona almonds, and sunchokes. However I was clueless (and remain so) about what kind of cheese they sprinkle throughout and what the dressing is composed of. So here I have made my best attempt to recreate this delicious salad, from ingredients I had on hand. 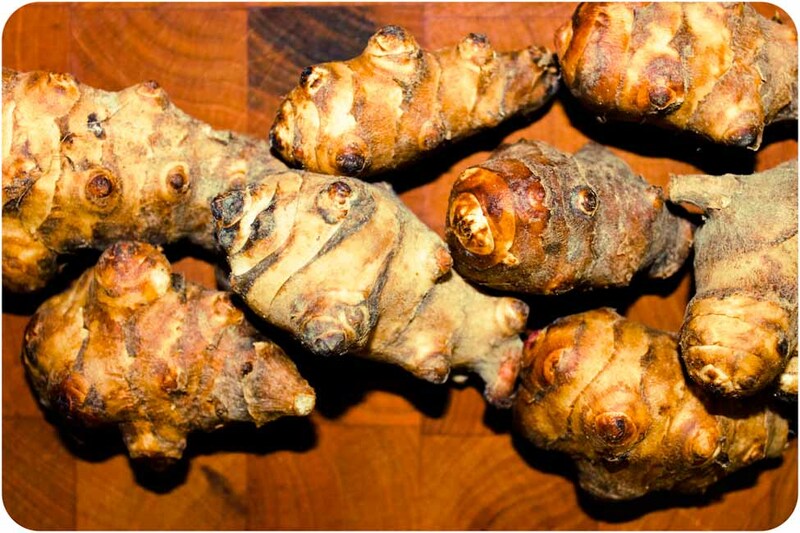 First a note about sunchokes, or Jerusalem artichokes. Funny enough, they are neither artichokes or grown in Jerusalem. Their outside is knobby and potato-skin like. While the inside flesh is firm and similar to a potato/jicama consistency. They can take some funny shapes. For the salad they are peeled, resulting in oval knobs. Once I peel them, I always add them to a lemon water bath (2 tablespoons of lemon juice + 1 cup of ice cold water.) This prevents them from browning. I don’t remove them from the bath until I’m ready to slice them and serve. Once the sunchokes were prepped, I moved onto the escarole. I like to remove all of the outer, dark green leaves when I’m making a raw salad (though they’re great cooked.) I sliced the escarole into bite size pieces and added to my salad spinner filled with ice cold water. I swished the pieces around a bunch, since escarole is often coated with dirt and sand. You can double this process if your escarole is especially dirty. Once the escarole soaked, I poured the water out and starting spinning. The result was this awesomely dry and clean escarole. I placed the escarole in the fridge to chill until the dressing was ready. The dressing I created was simple: 1 part olive oil, 1 part walnut oil, and 1 part lemon juice. A simple shake of the 2 oils and lemon juice in a jar, and voila–dressing was ready. Finally, I chopped some marcona almonds. When ready to assemble, I filled a salad bowl with the escarole, topped with sliced sunchokes, and poured the dressing over to toss. Once well combined, I sprinkled a quarter cup of grated pecorino and the chopped almonds on top. (This would actually work even better with some mild feta.) For the last step, I seasoned with salt and pepper and mixed again. Voila. It may not be as good as Otto, but it’s darn close–and really delicious packed with crunch. 1. Add the olive oil, walnut oil, and lemon juice to a small jar with a lid and shake until well combined. 2. In a large salad bowl, add the escarole and sunchokes. Pour the dressing on top. Toss well. Sprinkle the almonds and cheese on top. Add salt and pepper to taste. Toss well again. Serve in chilled salad bowls/plates.